Tongue Mountain is many things. 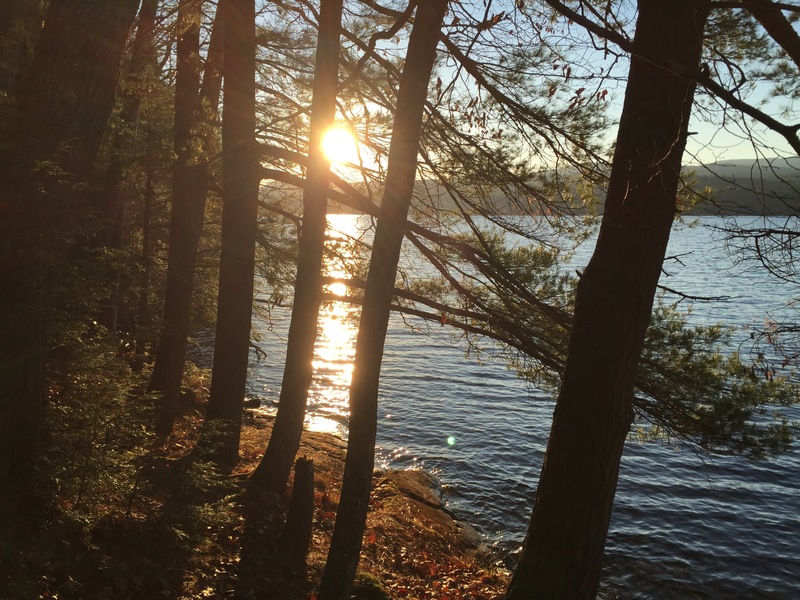 It is the most interesting hike in Lake George, as well as the most challenging. 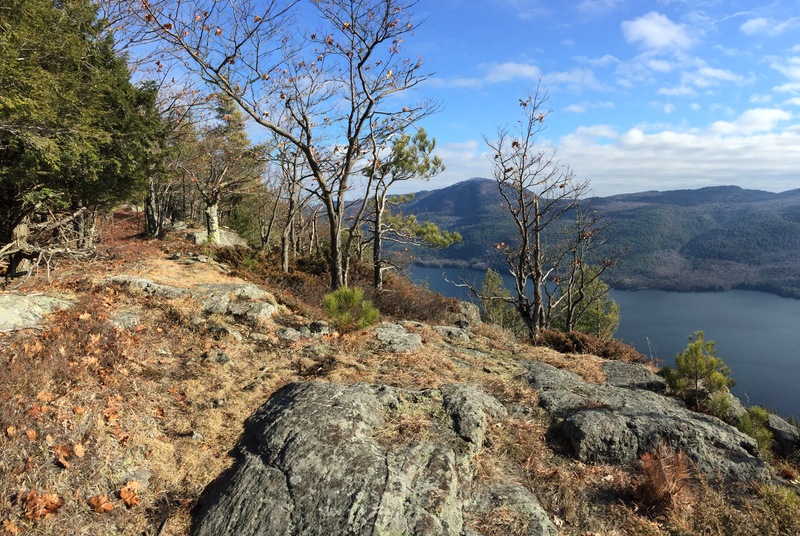 It is the most beautiful hike in Lake George, yet it is, irreconcilably, less popular than the others. It is the home to many venomous, though well-meaning, snakes. 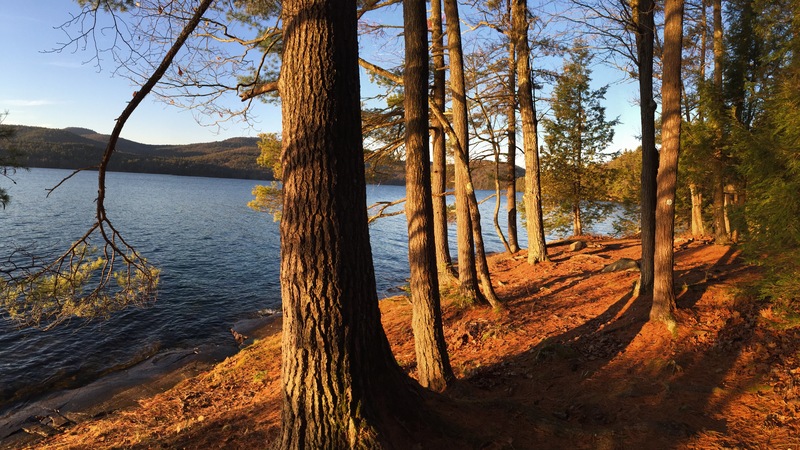 It is the jewel of Lake George, yet lent short shrift by the DEC (if the condition of the trail bears any indication). The Tongue Mountain Range is a peninsula which juts into Lake George. It comprises a handful of named mountains, and an indeterminate amount of nameless ones. As of this writing, I cannot speak for Upper Tongue, which encompasses Five Mile Mountain, the tallest “peak” on Tongue Mountain, coming in at 2,258ft. It is my understanding, Lower Tongue, a (by my estimate) 13.7 mile loop, which I have done in its entirety, is where it’s “at” — I am curious about seeing the rest of Tongue. Look for my impressions of Upper Tongue to be an addendum to this post. I recently made two trips to Tongue on the last two Mondays of November. The first time around, I got a late start and did not have enough daylight to continue the loop beyond French Point Mountain. I made sure that would not happen again. 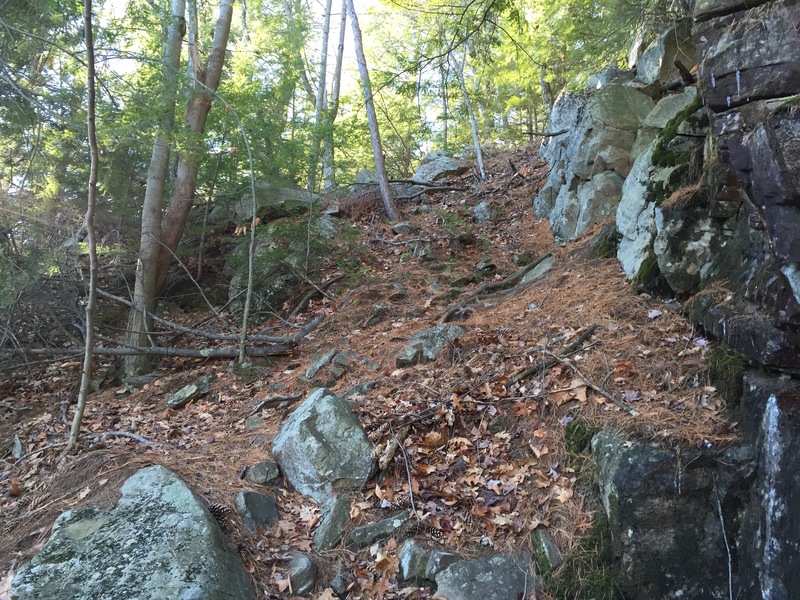 Though it did not buy me much time, I omitted Fifth Peak on the second go round — more specifically, I did not divert from the main trail, a two-tenths of a mile (or so) jaunt up to Fifth Peak. There was a reason I put off doing Tongue Mountain for so long. As I said earlier, a species of Timber Rattlesnake is indigenous to the peninsula. A bulletin in the Clay Meadows trail register reminds you of this — it says they come in different colors and you best leave them to their own devices or else you will be prosecuted. My friend, who has ridden a unicycle across the range, attests to having never seen a snake in all the times he’s come to Tongue. Sure, as you’re whizzing by on a unicycle how much do you see? I have this image of a snake, unbeknownst to him, caught in the spokes of his tire, whirling around for half a mile then ultimately flung into the lake. While I may have an (initial) aversion to happening upon one on the trail, I recognize they are more our allies than anything else. They feed on the small rodents which convey ticks. Next time you see one, instead of shrieking in fear, perhaps you should fist pump the rattle. Still — lest I had trod over one or groped for a branch which turned out to be a rattler — I purposefully waited for them to enter a state of brumation. As far as I know, brumation is hibernation done reptile style. I believe I read somewhere (and I can’t seem to find the article) that the hibernaculums these snakes hunker down in through the long winter are “open to the public,” meaning they share them with other species — like turtles, bears, a Syrian refugee or two. Come to think of it, I may misremember what I read. The Tongue Mountain range can be accessed from two trailheads, one from the west and one from the north, both off Rte. 9N. The one from the west is Clay Meadows, from which both of my hikes began. It is the starting and ending location of the Lower Tongue Mountain loop. About two-tenths of a mile from the trailhead is a junction, at which point those driven to do the loop must decide what direction they wish to do it. I recommend clockwise so you are facing the good views as you head south on the ridge. Sadly, many opt to do just Fifth Peak, an easy 2.7 mile (one way) hike, out and back. The real magic of Tongue Mountain doesn’t begin until French Point and onward. Note the yellow marker on the tree to the left. This represents the turn-off to the summit of Fifth Peak. The blue trail (Tongue Mountain Range trail) continues straight. See if you can espy the blue marker attached to a log. The climb up to Fifth Peak is rather unremarkable, not steep but surely steady. About two miles from Clay Meadows is another junction, this is the connection to the Tongue Mountain Range trail which runs north to south, up and down over the ridge. From here, Fifth Peak is seven tenths of a mile. There is no sign for the turn-off to Fifth Peak, but the yellow markers to left signal its beginning. The view from Fifth Peak is nice but (in my estimation) not the best the range has to offer. It should be said, the time of the day informed my appraisal of the view. Fifth Peaks may be best exploited as a great camping sight — the lean-to has the view from its entrance. A campfire ring is on the western end of the summit and from it is a good view of Northwest Bay and the mountains out to the west, such as Crane and Gore. An optimal place to camp out with family and/or friends. View to the west from Fifth Peak summit. Fifth Peak is something of a siamese summit, the TMR trail passes directly over the southern component, no turn-off. From here there is a steep descent to the col with one of the many anonymous mountains to the south. The trail between Fifth Peak and French Point Mountain is likely the most rugged section of the loop. There are many ups and downs and blowdown galore. This trail could stand to be cleaned up but it clearly gets less use than the trail up to Fifth Peak. 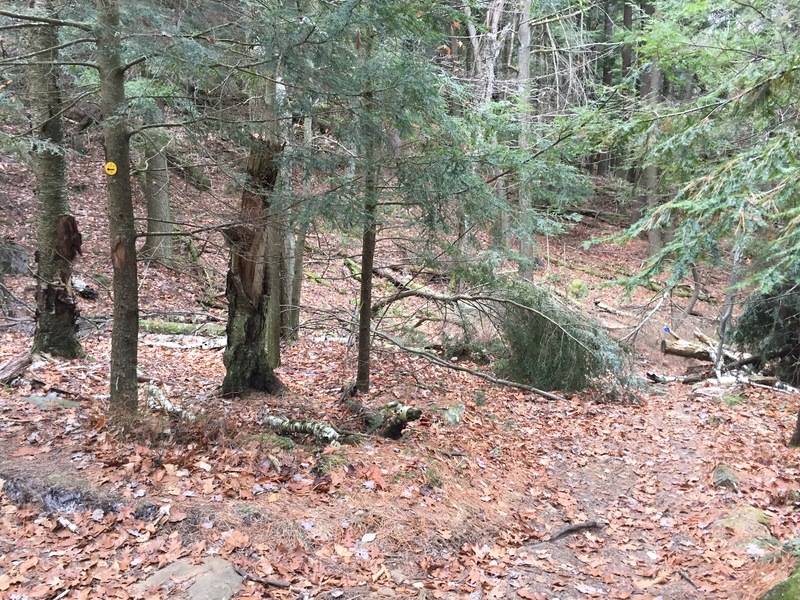 This “maintained” trail makes some of the herd paths I’ve done in the High Peaks appear as well looked after as Joan Benet Ramsey. The southern summit component of 5th Peak, part of the trail. There aren’t many views on this rugged segment but the payoff comes at French Point Mountain, arguably the finest view in all the range. Great views are more prevalent from French Point to First Peak than from Fifth Peak to French Point — and the former is less work to boot. Once you get past French Point, you may find your pace slacken — you’ll be fumbling for your camera with the regularly occurring vistas. Earned elevation is ephemeral on Tongue Mountain. View from French Point Mountain. Perhaps the finest view in the range. On the other side of Lake George (left to right): Black Mountain (the antenna atop gives it away); two bumps over, Erebus; then, Sleeping Beauty; the big, rounded silhouette where the lake bends is Buck Mountain. View from the trail, near French Point. I hung around on First Peak waiting for the clouds to depart to get the best picture I could. I don’t know which summit has a better view — French Point or First Peak (or one of the many views in their midst from the trail)? The conditions were nicest the time I first visited French Point. First Peak has the best view of where Lake George bifurcates to its upper and Northwest Bay; from French Point, this view is mostly obscured by First Peak. Moreover, looking across the lake, the ledges of Sleeping Beauty become evident by First Peak. Oh, another great view from the trail. Ho-hum. On the way down from First Peak. The great views continue in earnest from First Peak and it is primarily down from this point, though would you expect Tongue Mountain not to go down without a fight? There are some more anonymous, little hills to surmount. Below First Peak is the steepest rock outcrop but in the High Peaks this is par for the course. A two-tenths of a mile spurt from the aphelion of the TMR trail will get you to Montcalm Point, otherwise known as the Point of Tongue. This part is mainly flat. There are few outlooks on various sides of the point, as the waves from the lake lap the shores. View to east from Montcalm Point. Shelving Rock Mountain, front and center. The five mile trek back to Clay Meadows hugs Northwest Bay. It is more demanding and rugged than I had anticipated. My misguided belief had it to be an easy homecoming, along the lines of Marcy Dam to Adirondak Loj miles. Compared to the trail along the ridge, the Northwest Bay trail is predominately flat and forgiving. “Compared” is the operative word. This trail is no walk in the park, rolling with capricious terrain, drawing away from the bay then returning. Rocks, tree roots, mud, at times, marsh hazard your step. With so little daylight left, I was forced to run when I could. Barring those with superior coordination, a sustained run on this trail is no easy undertaking for most. I lament failing to fully appreciate the beauty of this Northwest Bay trail but I wanted to make it back before nightfall, as the trail was difficult enough to follow by day. The misfortune of being behind schedule is testimony to the beauty of the trail. View from Northwest Bay trail. Sun setting through trees on the Northwest Bay trail. Before returning to the junction two-tenths of a mile from Clay Meadows, in the vein of the rest of the hike, there is one final hill to climb. The trail draws inland and upward more than 200 feet, and, in the vein of the rest of hike, all gained elevation is promptly lost before the junction. 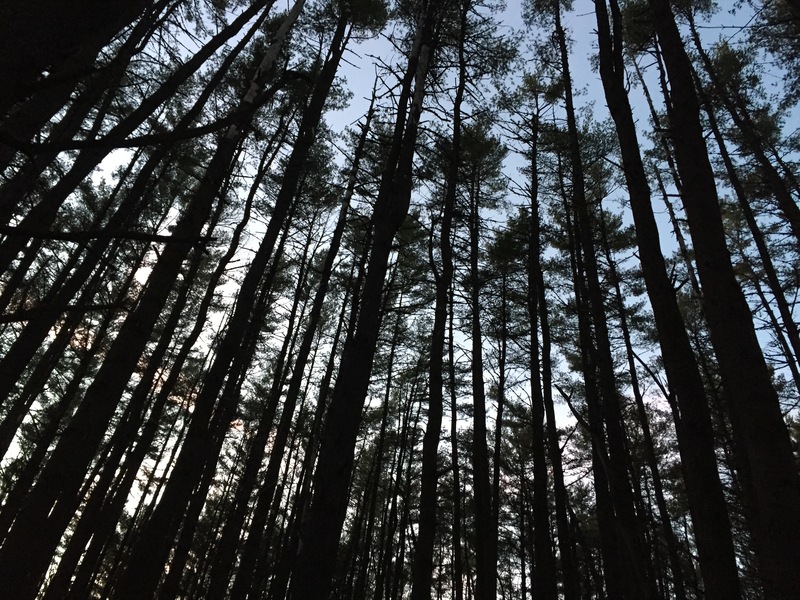 Tall evergreen trees near Clay Meadows. Never judge a mountain by its elevation. This loop of Tongue Mountain is more challenging than some of the High Peaks and more beautiful than many of them. There are two virtues to going in November. For one, the trees have been denuded of their leaves and the views are more persistent. The other, as you predicted, it is sans snakes, none to inadvertently step on or clutch. By this point, I have become disinhibited with Tongue and would not be averse to returning when the snakes are active. One of the downsides of visiting Tongue in November — and this is more of a hypothesis — has to do with the low angle of the Sun at this time of the year. I surmise the views down the ridge would be more spectacular without the Sun in your eyes. I could be mistaken. Seasoned Tongue’rs: feel free to comment and leave your impressions of this trail at different times of the year. I would love to hear them. 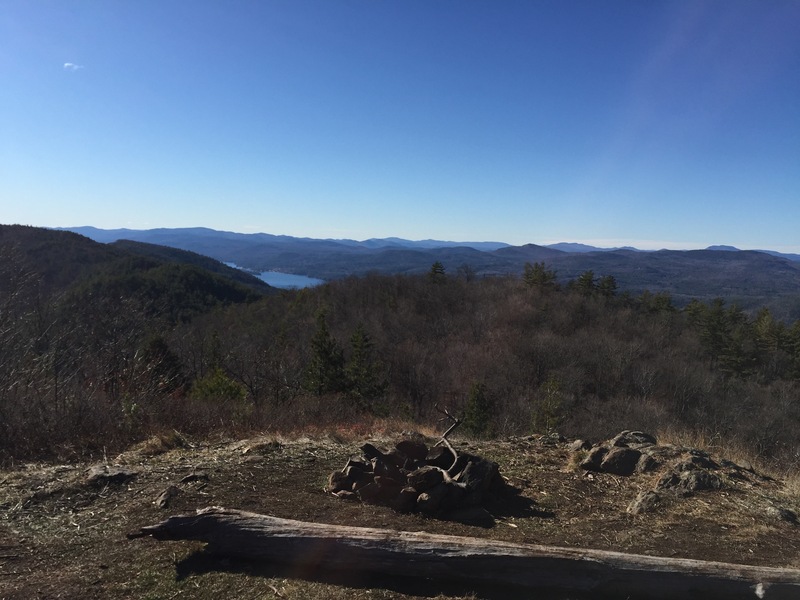 This entry was posted in Adirondacks, Hiking, mountain, trail, Uncategorized and tagged Clay Meadows, Fifth Peak, First Peak, French Point Mountain, Lake George, Montcalm Point, Northwest Bay, Tongue Mountain. Bookmark the permalink. This is a seriously fantastic hike, but heed warnings. October 12 2016 I started from Clay Meadows at noon hiking up to Fifth peak including the side trip to the lean to and view. It was a perfectly gorgeous day, clear, cool, angle of sun not too low, at first. 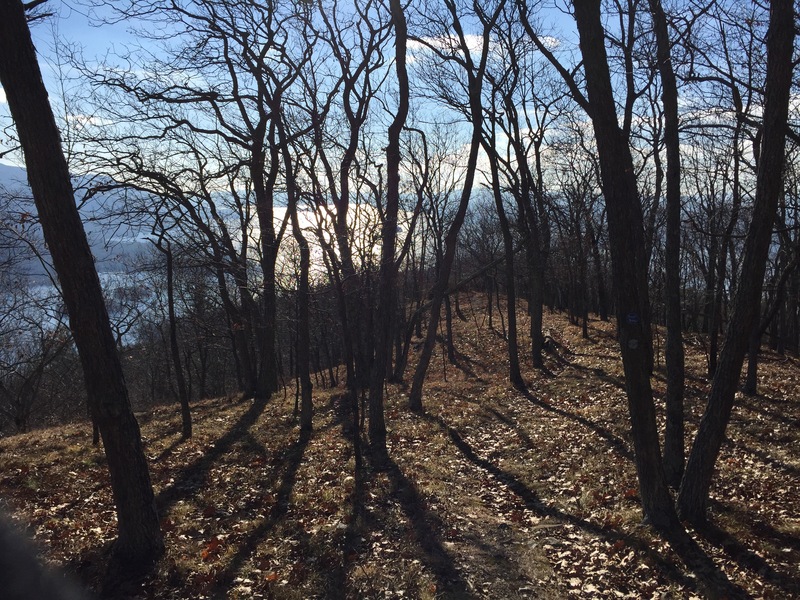 The ups and downs were exhilarating and the views magnificent even though I was rushing a bit… When I reached the sign to Montcalm Point/ Clay Meadows I realized I did not have much daylight left. But I had convinced myself that the return along northwest bay would be easy compared to the great ups and downs that came before. And, I thought, if I lost the trail I would just follow along the water. Oh boy. As soon as the sun went down I did lose the trail. I also lost my glasses to the incessant brush (and, nearly, an eye) and I almost lost my boots tarzaning it along the boggy shore in the dark, making an effort to cling to living tree branches to pull myself out of knee deep mud. I was not exactly lost and I was sure I would make it back to the clay meadows trail and the bridge across the beaver dam, eventually. But if it had been a moonless or cloudy night, I might have missed that too. Luckily the moon, only a few of days short of full, appeared just in time to magically highlight a clear way west which was the trail out. I reached my car at 8:20. I can’t wait to do this entire loop again next October but I will start much earlier in the day to fully enjoy the high ridges and see the bay trail for the first time. Interesting and harrowing story! Glad you made it out in one piece. I thought the same about the trip back along Northwest Bay and wound up surprised, barely escaping in the light. In the warmer months, you will need to carry alot of water…you simply won’t find anything along the ridge. That being said, the high trail is dries up quickly..the low trail never seems to dry. Interesting. I could imagine the snakes love drying up. Right, rattle snakes dont need much water, but all of their food does. So there are at least two dens by the water..one of which is marked. I have seen juveniles on the trail along the lake on Northwest bay on small rocks. I have seen a rather large one laying in the middle of the bridge near the trailhead, putting casual hikers in a state of anxiety. Up on top, typically they are sunning themselves on rocks with an easy egress to vegetation-cover. I imagine that the chipmunks that they feed on give them all the moisture they need. Supposedly it is the northernmost habitat for rattlesnakes. At the junction of the trail to Brown Mountain, the trail that goes down to the eastern shore of the tongue, and the loop trail, there is a pond. It has both beavers and snapping turtles. And probably cryptosporum as well… this virus is too small to be eliminated by filtering. If you are headed to/from Montcalm Point, look for a little bay without any rocks.. It has a flat muddy entry, but the corners of the bay are rocks. It is one of the few places to land a heavily laden sea kayak in such a way that you can comfortable step out of the boat, keep it from getting scratched, and have some traction. If you take a swim out to 6-7 feet of depth, you will find the remains of wreck. I don’t know what it is, but all the holes in the beams were hand-hewn. The ribs and frame of the boat are clearly visible. What is left of the planks resemble large pieces of bark.